Shepherd's Pie, American Style | Let's Cook With Bry! 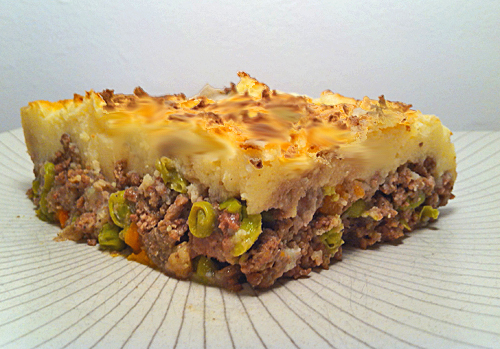 Shepherd’s Pie is an English dish, traditionally made with ground or diced lamb, hence the name. 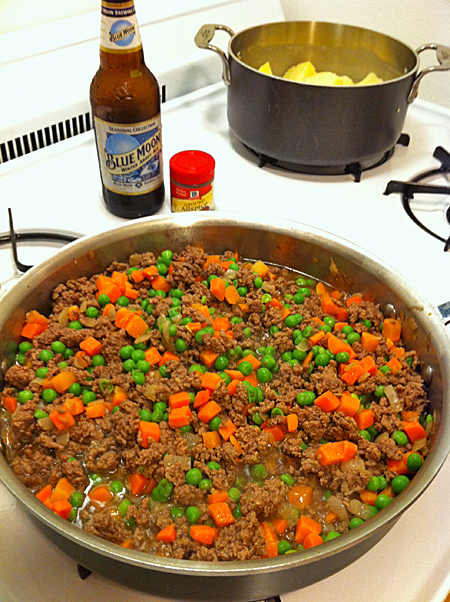 Americans usually make it with ground beef, which is actually called “cottage pie” by the English. 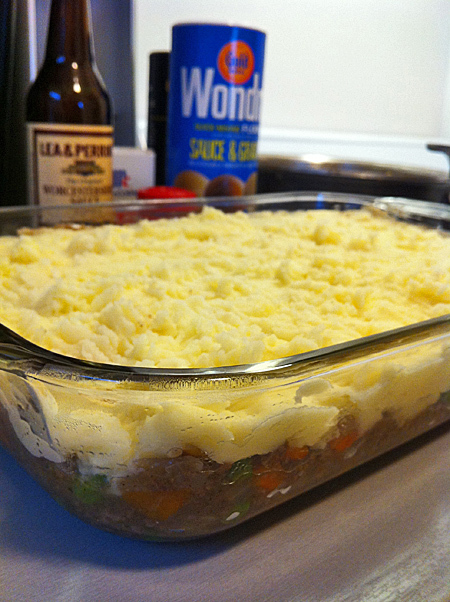 However it’s known, Shepherd’s Pie is basically a layered casserole of cooked meat and vegetables topped with mashed potatoes, which is then baked. The spices and dark beer give it a particularly hearty and satisfying flavor. Peel and quarter potatoes, boil in salted water until tender (about 20 minutes). Drain and return them to the pot. Preheat oven to 400°. Meanwhile, melt 2 Tbsp. of the butter in a large frying pan. Sauté onions and garlic in butter over medium heat until tender, about 10 minutes. Add ground beef and sauté until no longer pink. If you are adding fresh vegetables, add the carrots with the onions, then add the peas and corn after the meat has initially cooked; otherwise, add the thawed vegetables once the meat is no longer pink. Add salt and pepper to taste, then add worcestershire sauce and allspice. Add beef broth and beer, and simmer, uncovered, over low heat for 10 minutes. Sprinkle the flour over the liquid in the pan, and stir to thicken into a gravy. Mash the potatoes with remaining butter, shredded cheese, and milk or sour cream. 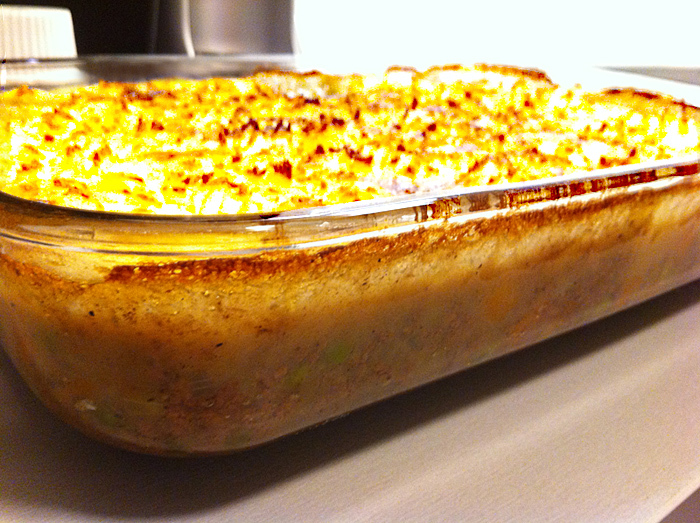 Place the beef/onion/vegetable mixture in a 9 x 13 glass baking dish. Distribute mashed potatoes evenly on top, spreading with a spatula if necessary to completely cover the meat mixture and seal around the edges. Rough up with a fork to create peaks that will brown nicely. Bake at 400° for 20-30 minutes, until bubbling and brown. Broil for the last few minutes, if necessary to brown.